Normally, oxygen inhaled into your lungs combines with the hemoglobin in your blood to form oxyhemoglobin. The oxygen is transported by the hemoglobin to the body's cells. However, when Carbon Monoxide is inhaled, the CO combines with the hemoglobin in your blood (called carboxyhemoglobin or COHb) instead of oxygen, thus depriving your body of the oxygen it needs to survive. The CO displaces the oxygen on your hemoglobin because the COHb bond is over 200 times stronger than oxygen's bond with your hemoglobin. The strong COHb bond also makes it difficult for your body to eliminate CO buildups from your bloodstream. That is also the reason why Carbon Monoxide can poison you slowly over a period of several hours, even in low concentrations. As the CO level in your blood increases, the amount of oxygen transported to your body's cells decreases. It is this oxygen deprivation that makes Carbon Monoxide so deadly. Sensitive parts of your body like your nervous system, brain, heart, and lungs suffer the most from a lack of oxygen. Unfortunately, the symptoms of Carbon Monoxide poisoning are easily mistaken for other common illnesses. For that reason, CO poisonings are often misdiagnosed. Symptoms such as headaches, , and fatigue are common to a number of illnesses such as the flu or the common cold. These symptoms can occur with a COHb blood saturation levels of 10-30%. At 30-50% COHb levels, you can experience nausea, severe headaches, dizziness, and increased pulse and respiration. If COHb levels in your blood go over 50% you may suffer from loss of consciousness, the possibility of collapse, convulsions, coma, and finally death. Carbon Monoxide results from the incomplete combustion of carbon based fuels. The term carbon based fuels encompasses all fossil fuels including kerosene, natural gas, gasoline, propane, butane etc. Organic substances such as wood, paper, and cigarettes, are also carbon based fuels. Basically anything you would burn for heat or use to power an engine can release CO. The less efficiently these fuels are burned, the more CO released by the burning process. That's why regular maintenance of anything in your home that burns carbon based fuels can significantly reduce your chances of being exposed to dangerous amounts of CO.
Running gas motors indoors also poses a serious Carbon Monoxide threat. A car or gas lawnmower that is running in an attached enclosed garage can cause a quick CO buildup in the home. Avoid running these types of devices while indoors, including gas and charcoal barbecues. Carbon monoxide is a colorless gas. To the human senses it is invisible. Carbon monoxide is a by-product of combustion and will appear naturally in any situation where burning has taken place. Carbon monoxide is a highly toxic gas which is termed a toxic asphyxiant, meaning it reduces the oxygen transport properties of the blood. It reacts with the hemoglobin in the blood forming carboxyhemoglobin which prevents the hemoglobin from transferring oxygen. Low ppm doses of carbon monoxide can cause headaches and dizziness. If the victim is removed to fresh air no permanent damages will result. High doses can be fatal. 200 Possible mild frontal headache in 2 to 3 hours. 395 Frontal headache and nausea after 1 to 2 hours. Occipital after 2-1/2 to 3-1/2 hours. 1600 Headache, dizziness, and nausea in 20 minutes. Collapse and death in 1 hour. 3200 Headache and dizziness in 5 to 10 minutes. Unconsciousness and danger of death in 30 minutes. 6395 Headache and dizziness in 1 to 2 minutes. Unconsciousness and danger of death in 10 to 15 minutes. 12,800 Immediate effects-unconsciousness. Danger of death in 1 to 3 minutes. It's colorless. It's odorless. And it's deadly. It's carbon monoxide, the leading cause of poisoning deaths in America. Carbon monoxide results whenever fuel is burned. That means gas appliances, gas and oil furnaces, and wood burning stoves and fireplaces can all produce carbon monoxide buildup in your home, making it extremely important that these and other sources be in good working order with proper ventilation. Have a professional check your furnace and fuel-burning appliances for leaks and proper venting once a year. Also have chimneys, flues and all other vents inspected for leaks and obstructions. And if you have a gas clothes dryer, don't forget to periodically check the outside exhaust for lint, which can block the vent and force carbon monoxide back inside. For added safety, install at least one carbon monoxide detector in your home. 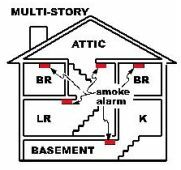 You'll learn more with Carbon Monoxide (Item 561C, free) which includes a checklist for identifying carbon monoxide sources in the home. When you write, you'll also receive a free copy of the Consumer Information Catalog. The Consumer Information Center of the U.S. General Services Administration revises and publishes the Catalog quarterly, so you know it's up-to-date. Its pages list more than 200 free and low-cost federal publications on a variety of subjects.